Football is in my blood. As a native Alabaman, it has to be. In the state also referred to as “The Heart of Dixie,” the sport known abroad as American football is a religion. In the years since I was (literally) born into the Crimson Tide family, football has supplanted all others as America’s most popular sport. But is it played beyond the borders of the United States? Most Americans would say no—only this isn’t true. Japan is actually home to a growing football culture. Both the college and pro games are played here, and to learn more about it, Metropolis hooked up with former University of Hawaii star Kevin Jackson. Now a member of the Obic Seagulls and an ambassador of sorts for the game, Jackson found his way to Japan more than a decade ago. After graduating from the University of Hawaii, where he played from 1999 to 2003, the former Warriors defensive lineman signed a free-agent contract with the Green Bay Packers. 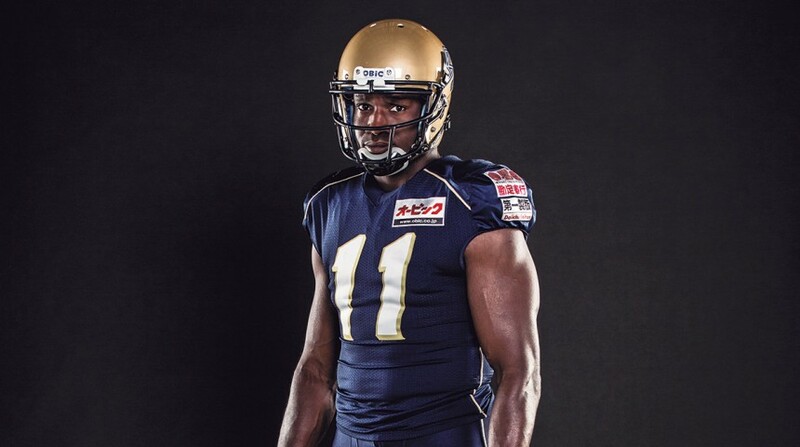 When the final roster did not include him, he found a new chance to get back on the field in Japan’s corporate-sponsored X League. Here, he met with immediate success, earning league MVP honors in his first outing in 2003. 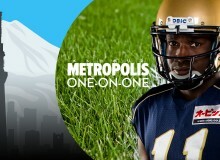 The X League is analogous to the NFL, being the sport’s top level where many players land after their college careers. While the rules of the game mirror those familiar to American fans, the structure of the league is quite different. The X League is divided into three divisions, with the top division comprising 18 teams, further split into three divisions: West, Central, and East—which the Seagulls call home. The season is also very different from the NFL. Rather than a marathon slate spanning from September to late January/early February, the X League has both spring and fall components. A spring tournament, which takes place in May and goes through early July at the latest, consists of five games that are played every other week. In the fall, five additional league games are played. These are followed by five more games as part of the playoffs, culminating in the championship game. To get into the playoffs, a team must finish in the top three in its division. The final two survivors face off in the X Bowl, which is played in the Tokyo Dome in front of more than 30,000 fans. As in America, football is widely played at the collegiate level and finds power concentrated in key areas. “There are several leagues all throughout the country,” Jackson explains, “but two main leagues—the two most competitive leagues—are in Kanto and in Kansai.” Leagues in Japanese college football are essentially the same as conferences in the United States. As if talking about the likes of Alabama and Ohio State, Oregon and Florida State, Jackson describes the centers of power in Japan. Structurally, the college season mirrors that of the X League. Games are played in both spring and fall, and a champion is crowned in a game that caps off the fall slate. In this case, the top two teams meet in the Koshien Bowl, played in Hanshin Koshien Stadium near Kobe, home of the Hanshin Tigers baseball club. Every year in the United States, one team is named college football National Champions and another is named Super Bowl champions. In Japan, there is just one ultimate champion. This debate is settled in the Rice Bowl, a contest between the X League champs and the college football champs. Imagine finishing off the 2014 season in the United States with a game between the Ohio State Buckeyes and the New England Patriots. Is that fair? “That’s maybe a strange concept for a lot of Americans, but that’s how they’ve done it here for years now,” says Jackson. When you break down the realities of Japanese football, it’s not quite as strange as it first seems. Beyond playing in the games themselves, Jackson is on a mission to bridge the football gap between Japan and America by encouraging learning about the game. When not on the field, he works in the Seagulls’ front office and organizes unique experiences for fellow players as well as school children—the league visits elementary schools to teach flag football. In August 2014, the Seagulls visited The University of Alabama in Tuscaloosa, the sister city of Narashino, where the Seagulls are based. It was a special trip for everyone as they toured the facilities and watched the Crimson Tide practice. While in Tuscaloosa, the Seagulls faced off against the Blazers of the Amateur to Professional Developmental League in the first-ever Sister Cities International Bowl. The Seagulls came up just short. The final score was Blazers: 16, Seagulls: 12. But Jackson sees it as another step in helping American football gain its footing here. Is there really a chance that the game could ever truly become popular in Japan? 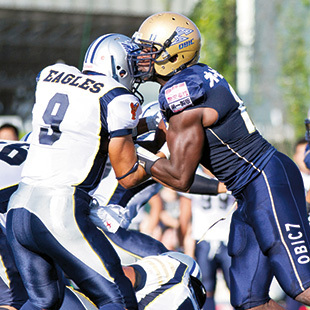 For more information about American football in Japan, visit www.seagulls.jp/english/ and www.xleague.com/english/.